from my doctor almost a month and half back. I have been writing about the journey(1,2 and 3). It has been a rollercoaster much like my blood sugar levels. 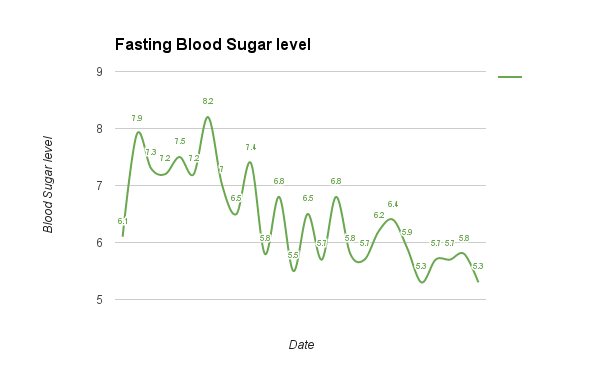 Check out the graph, for those of you who are asking what the heck is on the y axis, so when you measure your blood sugar, the fasting blood sugar level should be below 5.9. My fasting blood sugar level has been below 5.9 for the past 4 days and the last 3 days without any medication. In addition, I have been monitoring the blood sugar levels 1 hour after a meal and it is suppose to be below 7.8 and my blood sugar is below that level as well. I have not graphed it because the fasting levels are more accurate measure of your blood sugar. I don’t want to take any medication, as I mentioned in my previous posts our medical professionals are not very good at preventative therapy. All of my doctors knee jerk reaction is to prescribe drugs i.e chemicals that have various side effects. I am very thankful to all the medical professionals but I have to say it, our measurement and tracking mechanisms are bad. The worse problem is we recommend medication when it is not needed. I have literally got my blood sugar levels back to normal by changing what I eat. I have stopped eating anything processed (meat, sugar, carbs, fats etc). I have started drinking more green juice, berries, vegetables and nuts. It is such a difference. I know that I am just scratching the surface of this. There are a number of books and research about this, unfortunately I am pretty sure we are not asking the right questions. High amounts of Lipoprotein(a), or LP(a). LP(a) is a type of LDL cholesterol, which is commonly thought of as the “bad” cholesterol. LP(a) is even more dangerous than LDL cholesterol and is strongly linked with heart disease. Your LP(a) level is largely genetically determined. LP(a) levels tend to be higher in South Asians than in Caucasians. 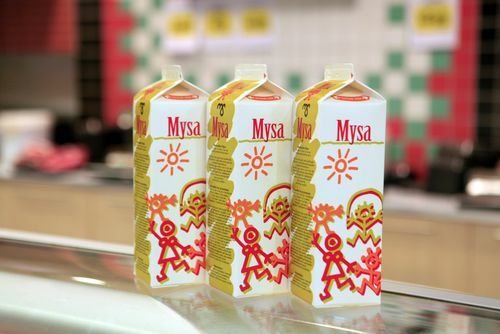 High amounts of homocysteine. Homocysteine is an amino acid that your body produces, and it is strongly associated with an increased risk of heart disease. Unlike LP(a), your homocysteine level is largely related to what you eat. South Asians tend to have high levels of homocysteine compared to other ethnicities. High levels of high-sensitivity C-reactive protein(hs-CRP). High hs-CRP levels are associated with both heart disease and diabetes. Studies have found higher hs-CRP levels among South Asians than other populations. Like homocysteine, high hs-CRP levels are likely related to lifestyle factors, like abdominal obesity and being physically inactive. Abdominal obesity. Many South Asians have a normal BMI, slim arms and legs, and a large belly. This is called abdominal obesity, and it’s more strongly associated with heart disease and diabetes than BMI. South Asians can develop diabetes with just a small amount of abdominal obesity. Plus, even those without abdominal obesity often have internal, hidden fat that covers their organs and contributes to chronic conditions. Metabolic Syndrome. If you have three or more of the following five criteria, you have metabolic syndrome: abdominal obesity, high triglyceride levels, low HDL levels, pre-hypertension, or pre-diabetes. Having metabolic syndrome puts you at high risk for heart disease and diabetes. One third of South Asians have metabolic syndrome. Thank you so much Gudrun. It is good to take the supplement chromium and use the spices/herbs cinnamon, oregano and Rosemary in cooking since these spice lowers blood sugar. I find this website very helpful, http://nutritiondata.self.com/facts/cereal-grains-and-pasta/5747/2 they give you information for the estimated glycemic load for all food. Brauðhúsið í Grímsbæ bakes a sourdough rye bread on Mondays, Wednesday and Fridays that bread is an excellent bread-choice for diabetics. Sounds great… ping me when are in town and have time.